Jim Yong-kim of World Bank, Christine Lagarde of International Monetary fund, Stacey Cunningham president of New York Stock Exchange, John Flint CEO of HSBC, as well as Credit Suisse, and Standard Chartered decided not to attend at Davos. Investment companies such as Uber, Mastercard, Virgin Group, JPMorgan Chase, Ford Motor Comp., Viacom Inc, and private equity firms such as Blackstone, BlackRock and Bain Capital are pulling out of Davos. Media outlets such as Bloomberg, CNN, New York Times, CNBC, The Economist, Financial Times and Los Angeles Times among others decided not to attend. Antonio Guterres; Secretary General of the UN, and Audrey Azoulay of UNESCO expressed their deep concern about the murder and called for investigation and punishment of the perpetrators. Many world leaders condemned Khashoggi’s murder and called for reprimanding the kingdom. Many European politicians and American senators called for halting the sale of weapons to the kingdom. Zionist Jewish terrorist groups and militias, similar to al-Qaeda and ISIS, had occupied Palestine in 1948, perpetrated numerous massacres against civilian Palestinians, razed to the grounds hundreds of Palestinian towns, ethnically cleansed almost 800 thousand Palestinians, and established a colonial state of Israel. 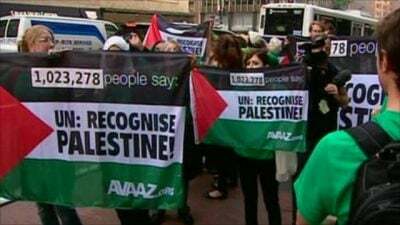 In 1967 those Zionist Israeli Jews again perpetrated more war crimes and occupied the rest of Palestine, destroyed more towns, massacred more Palestinians and built more illegal colonies. Although these Israelis entered into peace treaty with the Palestinians they are still ethnically cleansing and murdering in cold blood Palestinians, usurping their land, and expanding and building more colonies in violation of all peace treaties and in violation of UNSC resolutions. Israeli crimes against Palestinians, as well as other Arab states such as Egypt, Jordan, Lebanon and Syria, have never stopped, but rather are increasing in number, in intensity and in ferocity. The US had used its Veto power to protect Israel from at least 44 UNSC resolutions. On top of those Israel has violated 300 other resolutions regarding its occupation of Palestine. To make matters worse the US leads other western countries in describing the Israeli genocidal crimes against Palestinians as “self-defense” and every Palestinian defensive and peaceful reaction as terrorist attacks. After seventy years passage of UNSC resolution 194 stating that these Palestinian refugees have the legitimate right to return to their towns and homes they were kicked out of, but none of the international legal organization nor any other country helped them implement this resolution, these Palestinian refugees decided to peacefully march back to their towns in what was dubbed“The Great Return March”. This march started on Friday 30th of last March and has been going on every Friday since then; so far, a total of 30 march attempts. Unfortunately, Israeli army snipers stood in their way, and have murdered in cold blood 212 Palestinians including teen agers, women, paramedics and reporters, and had injured a total of 22,000 others causing a lot of limb amputations due to their use of the explosive hollow pointed bullets, poisonous gas and stun grenades. Yet, despite the obvious fact that Israel is the number one rogue state in the world, Nikki (Nimrata) Haley; the American ambassador to the UN, had the audacity to describe this Israeli army killing fields against civilians in Gaza as the most restrained army in the whole world. “No country in this chamber would act with more restraint than Israel has.” She stated. When comparing the international reactions to the murder of one person; Khashoggi in this case, with the reactions to the heinous war crimes against millions of innocent people in Palestine, Syria, Yemen or in any other place around the globe for that matter, one cannot help but question the validity of the famous proverb that “justice will always prevail”. Are we cheating ourselves and our children when we assert the fallacy that evil will be defeated and justice will always prevail at the end? Studying the history of Mankind, one discovers that those, who had the military power to assert their rights and their own form of justice even if they contradict the rights and justice of others had always prevailed, and those, who lacked military power had no chance to assert their own rights and had always perished. This proves that the rule of law, even the laws approved on internationally, is irrelevant, and that might is right still prevails in this world.